Owing to the large number of searches on this blog for “House Price Register”, “House Price Database”, “Actual Sales Prices Ireland”, “Transaction prices Ireland” , a new tab is being opened today, 1st May 2010, to keep track of the government’s progress with setting up what they call, and what will here on in be called here, the House Price Database. A blog entry today brings us up to date with progress to 1st May, 2010 – in short, called for decades ago, a current growing demand from all corners for the Database, a promise in the renewed Programme for Government in October 2009 and monthly questions by our Opposition Deputies in the Oireachtas (which are being met with answers from the housing Minister, Michael Finneran, that some have characterised as spoofery). 7th June, 2012. 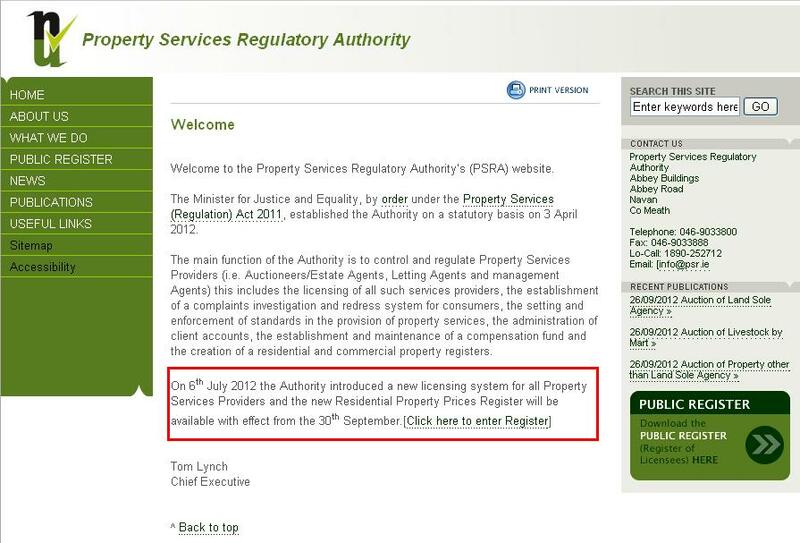 According to a commenter on thepropertypin.com, the PRSA has set itself an “outer limit of September this year” to implement the database going back to 1st January 2012. 4th November, 2011. The Property Services (Regulation) Bill has passed the Seanad stage and is likely to be made into law in the next month. The quango charged with maintaining the register, the Property Services Regulation Authority in Navan, Co Meath says that it expects to have the register up and running by June 2012 and that it will contain prices going back two years. 11th October, 2011. The Property Services (Regulation) Bill is due to be debated in the Oireachtas on 19th October 2011. 16th June, 2011. Questions were tabled in the Dail last week by Fianna Fail Deputy Dara Calleary to the new-ish Minister for Justice and Equality, Alan Shatter asking when the new database would be introduced. The reply was that an amendment would be tabled to the Property Services (Regulation) Bill and that it would be debated as soon as new committees were formed, which happned late last week. There is no reason why the legislation can’t now progress but the absence of any urgency by this new government is disquieting. 13th May, 2011. The Irish Independent reports that the HPD will only contain historical price information going back to 2010 only. It claims that only prices captured by the Revenue’s e-stamping, electronic information system will be captured and that was only introduced in December 2009. 12th May, 2011. The Property Services (Regulation) Bill was restored on 25th March, 2011 but has not been worked on in the Oireachtas since. 10th February, 2011. We’re in the thick of the election campaign and whilst the outcome after 25th February, 2011 is uncertain, the betting is that the next administration will feature FG in some capacity. And FG is reported to have said that it will re-instate the Property Services (Regulation) Bill in its state just before the Dail was dissolved which might bring forward the day when we have an HPD. 22nd January, 2011. An amendment to the Property Services (Regulation) Bill was published during the week but the betting must surely be that there will be insufficient time to agree the amendments before the present Dail is dissolved. 26th December, 2010. Perhaps with a depressing inevitability, it seems that the Minister has failed to introduce the promised amendment to the Property Services (Regulation ) Bill in the Autumn session. 13th November, 2010. There is still no sign of any Bill amendment from the Minister for justice and Law Reform, Dermot Ahern though he does have another month if he is to meet the commitment he made at the start of August 2010 when he said he would introduce legislation “in the next Dail session”. The most recent exchange on the matter in the Dail was on 19th October, 2010 when Labour Party Deputy Jan O’Sullivan asked the Minister for the Environment, Heritage and Local Government the progress that has been made on the establishment of a national house price database and the reply from Minister of State at the Department of the Environment; Heritage and Local Government FF Roscommon – South Leitrim Deputy Michael Finneran “To take account of the lack of reliable sales prices in the case of residential property, and accurate information on market rents and other terms, including rent review clauses, in the case of commercial leases, the Government made a commitment in the renewed Programme for Government to create and maintain a comprehensive register in respect of commercial and residential property transactions. October 18th, 2010. Just picked up today was the question posed in the Oireachtas by Fine Gael Deputy Leo Varadkar on 29th September, 2010. The Minister for Justice refers to the amendment being introduced “in due course” though he has previously committed to introducing the amendment in “the next Dail session” (ie the one that end in December 2010). Deputy Leo Varadkar asked the Minister for Justice and Law Reform the reason responsibility for the property price database is being afforded to three separate bodies, the Department of the Environment, Heritage and Local Government to compile, the Property Services Regulatory Authority to publish it and the Revenue Commissioners to provide the information when the PSRA already has central repositories of the relevant information, in the Land Registry from 1891 and in the Registry of Deeds from 1707; and if he will make a statement on the matter. Minister for Justice and Law Reform (Deputy Dermot Ahern): The Property Services (Regulation) Bill 2009 provides for establishment of the Property Services Regulatory Authority. While the primary functions of the Authority will include operation of a licensing system for property services providers and the investigation of complaints arising from the provision of property services by such providers, the legislation also gives the Authority a role in promoting consumer protection and protecting the best interests of users and potential users of property services. In the Renewed Programme for Government agreed last year, the Government recognises that the lack of transparency in the property market, including the lack of reliable sales prices in the case of residential property and accurate information on market rents and other terms, including rent review clauses, in the case of commercial leases, is an impediment to consumer protection and needs to be tackled. I intend, therefore, to bring forward amendments to the Property Services (Regulation) Bill in due course to give the new Authority the statutory function of publishing details of both residential sales prices and commercial leases, including rent review clauses. In order to be useful, this data must be both reliable and up-to-date. For this reason, it is intended that details which, under existing stamp duty legislation, must be supplied to the Revenue Commissioners for stamp duty purposes within 30 days following the sale or lease of property will be made available to the Property Services Regulatory Authority for publication. Publication will ensure the required level of market transparency and meet the needs of statutory and other bodies involved in tracking market trends and compiling statistical data on the property market. The primary purpose of the Property Registration Authority is to promote and extend the registration of ownership of land and I am pleased that the Authority has made very significant progress in this area since its establishment in 2006. As regards the availability of price data, I understand that while it had been the practice to publish details of prices when a sale or lease transaction was entered in the Land Register, that practice was discontinued many years ago. Moreover, while the registration of leases of over 21 years is compulsory in all counties except Dublin and Cork, commercial leases are normally of much shorter duration. The Property Registration Authority would not therefore be in a position to supply useful data in respect of the commercial property market. October 16th, 2010. The Minister for Justice and Law Reform, Dermot Ahern, is to introduce shortly (and before Christmas 2010) amendments to the Property Services (Regulation) Bill 2009 to give effect to the HPD. The amendment will be published on the Oireachtas website here. October 6th, 2010. There is some confusion about the imminent fate of the HPD as the Taoiseach’s legislative programme for the Autumn 2010 session of the Dail does not appear to contain draft legislation to give effect to the HPD as signalled by the Minister of Justice Ahern on 10th August, 2010. Enquiries are being made to establish precisely where the committed legislation is. August 22nd, 2010. The Sunday Tribune reports that the HPD may not require any change to the Data Protection legislation. Quoting Billy Hawkes, a spokesman for the Data Protection Commisioner, they say that the government can exclude house price data from the ambit of the Data Protection Act. They also claim that the HPD will include historical data though how far back the database will go is unclear. August 18th, 2010. Although the House Price Database is to hold a record of residential property transactions, it seems that Minister for Justice and Law Reform, Dermot Ahern, has caught the transparency bug because he is now proposing that there be a database of commercial rental transactions. Yesterday the Minister published the reportof the Rent Review group which recommended the creation of a commercial rents database and an adoption of a uniform Rent Review Arbitration Code – the Minister welcomed the report and says he supports the recommendation. August 12th, 2010. Some commentators have suggested that although the Bill might be introduced over the next four months it might be some time before the HPD is up and running and even more time before it provides any useful information. Tom Elliot, the head of the Property Services Regulatory Authority (PSRA), a quango which up to now seems to have had its business confined to registering managing agents, says that he expects the HPD will provide the property address, date of sale and actual sale price and there seems to be an expectation from the report in today’s Irish Times that the HPD will be introduced sooner rather than later. At this stage there are two big gaps emerging – 1) will historical sales be entered and if so how far back will the HPD go and 2) will we be able to find out who owns a particular property if that property has not been subject of a recent sale. It is also to be hoped that strict rules are put in place to capture sale prices (eg what is the sale price if an apartment is sold for €300k but includes furniture and the vendor guarantees rent of €24,000 per annum for two years? what steps will be taken to avoid inflated related party sale prices in developments designed to establish anchor prices for future sales?). The report in the Times concludes with the HPD being welcomed from all quarters including estate agents. August 10th, 2010. Ministerial announcement from Dermot Ahern. It seems that the HPD might be up and running by December 2010. July 22nd, 2010. The IAVI expresses concern for the introduction of the HPD because of the government’s recent statements which suggest that a property tax will not be introduced for some time. The IAVI plainly associate the HPD as a precursor to a property valuation/taxation system. The IAVI also apparently believe that the introduction of the HPD would require a “simple change to the data protection legislation”. Lastly the IAVI repeat their widely accepted claim that a HPD would support the transparency needed for the sustainable operation of their industry. As the IAVI is the only independent private sector member of the working group to introduce the HPD it is to be hoped that their views are expressed in very robust terms to the DoEHLG. July 15th, 2010. Alan Cooke, the Chief Executive of the IAVI writes a letter to the Irish Times in which he states “the IAVI representatives strongly championed the creation of a transparent and complete database for property transactions and a consensus of support for same emerged among those attending.Since the review of the Programme for Government, the creation of such a database is now Government policy. It is reasonable to suggest that the IAVI, representing qualified estate agents and valuers, played a major part in bringing that welcome development about.” Indeed the IAVI is the only private-sector member of the government’s working group to bring about the House Price Database – this was announced in March 2010. IAVI members may wish to ask their Chief Executive about the progress of that group, specifically are there terms of reference, a timetable for the creation of the HPD, what assistance is provided to the group (financial and legal) and how often has the group met. Some IAVI members may have reason to very upset at the suggestion that the IAVI is being used as a private-sector figleaf of respectability for a working group that doesn’t appear to be doing anything with a sense of purpose. After all if some of the bigger agencies who are NAMA valuers may have access to property transaction information, then why should smaller agencies be deprived of a competitive advantage. July 8th, 2010. Minister of State for Housing, Michael Finneran still claims that development opf the House Price Database is one of the 9 priorities for his department over the remainder of the present government term (May/June 2012 at the maximum). In an exchange with FG’s Terence Flanagan who asked what the priorities of the Housing Minister were over the remainder of the term, Michael Finneran listed 9 priorites and the House Price Database was priority 8 though the Minister didn’t say if he was ranking priorities. Still nothing tangible though, and the betting would be if he was asked directly about the HPD, he would say he was still examining shapes and considering implications for the Data Protection Act. June 22nd, 2010. Minister at State at the Department of the Environment Heritage and Local Government, or more commonly the Housing Minister, Michael Finneran must be missing the shame gene as yet again he has given the same pat response that his department is examining the shape of a database and whether the Data Protection Act needs be amended. He was responding to questions from FG Deputies Olivia Mitchell and Alan Shatter. Whether or not the Data Protection Act needs to be amended (arguably not because a sale price is not necessarily “personal information”), there would appear to be little procedural difficulty in putting a system in place. Michael Finneran is of course the deputy for Roscommon-South Leitrim, a part of the country where there is a famed over supply of housing. The IAVI and CIF support the quick introduction of an House Price Database and of course in a falling market there is a danger that the fall will overshoot more than it needs to – a HPD would help bring realism to the market and clear unsold stock, something in which you would have expected Mr Finneran’s constituents to be very interested. June 14th, 2010. Following on from last week’s surprise opinion poll which put Labour ahead of FF and FG, the party yesterday through Deputy Ciaran Lynch re-affirmed its commitment to a House Price Database. In the context of a call for a national rent-to-buy scheme for social housing, Deputy Lynch confirms that the Labour policy of implementing a House Price Database will have a wider range of benefits than might be at first apparent. May 25th, 2010 – Labour Deputy Leader, Joan Burton submitted a written question to the housing Minister and is told that he is still examining the shape of the register and consulting with interested parties and that the creation of the HPD will potentially involve examining the Data Protection Act. In other words, nothing of significance is happening. May 19th, 2010 – The DoEHLG has just confirmed that ” The Department has held meetings with a broad range of interested parties to gather views on the shape that such a register might take. This range of interested parties includes the Department of Justice, Equality and Law Reform, Central Statistics Office, Institute of Auctioneers and Valuers of Ireland, Property Registration Authority, National Property Regulatory Services Authority and the Department of F nance. Once the work of this group has concluded, recommendations will be made to Government. The timing of the establishment of the register will be determined by a range of factors including the possible need to amend the Data Protection Acts to allow for achieved sales prices to be published.” See copies of the email sent to the parties named above with responses here. NAMAwinelake has also contacted two Dail Deputies asking that they (again) submit questions in the Dail and give consideration to developing a motion with respect to progressing the House Price Database. See the correspondence here. May 10, 2010 – “astonishing and appalling” is how Trinity College Dublin Professor of Finance, Brian Lucey, characterised the lack of property data available to improve discussion of the property market. May 6th, 2010 – Last night Vincent Browne learned a new word on his under-recognised “Tonight with Vincent Browne” programme on TV3 – the new word was “cadaster” which is a public record of land ownership showing who owns what. Vincent’s tutor was Emer O’Siuchru (architect and valuer) – she said eight people owned most of the development land in Dublin and the local authorities didn’t even know who they were. She said Ireland was unique in Europe, indeed in the developed world for not having a cadaster. Haven’t seen an update yet but anyone know what happened with this today? @Dreaded, it was set to be considered in the afternoon by the justice committee but I don’t have any update. Anyone? Looks like we are finally on. Now how long before it starts to publish…..
but it’s unclear what the source is for that – the statement from the head of the PRSA seems to relate to the delay in getting to yesterday’s statement by Minister Shatter. You might say that heads should roll given the amount of time the agency has had to prepare, what 2-3 years. Let’s see if we can get a statement from Geraldine Clarke, the chair or Thomas Lynch, the chief executive. Since the link to the tribune is dead, this is a Wayback machine link for the article citing the Data Protection Commissioner’s spokesman.